Pain Reliever, Nighttime Sleep Aid. For the temporary relief of occasional headaches and minor aches and pains with accompanying sleeplessness. Adults and children 12 years of age and over: 2 caplets at bedtime if needed or as directed by a doctor. Alcohol Warning: If you consume 3 or more alcoholic drinks every day, ask your doctor whether you should take acetaminophen or other pain relievers/fever reducers. 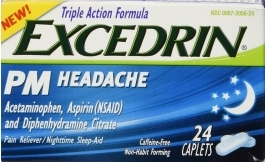 Acetaminophen may cause liver damage. Keep out of reach of children. In case of overdose, get medical help or contact a Poison Control Center right away. Prompt medical attention is critical for adults as well as for children even if you do not notice any signs or symptoms. As with any drug, if you are pregnant or nursing a baby, seek the advice of a health professional before using this product. Do not give to children under 12 years of age or use for more than 10 days unless directed by a doctor. If symptoms persist or get worse, if new ones occur, or if sleeplessness persists continuously for more than 2 weeks, consult your doctor. Insomnia may be a symptom of serious underlying medical illness. Do not take this product, unless directed by a doctor, if you have a breathing problem such as emphysema or chronic bronchitis, or if you have glaucoma or difficulty in urination due to enlargement of the prostate gland. Avoid alcoholic beverages while taking this product. Do not take this product if you are taking sedatives or tranquilizers without first consulting your doctor.